And it might just offer brands the biggest bang for their content marketing buck. Though slightly in the shadow of big sister Facebook, Instagram boasts over 1 billion active monthly users globally. It’s eclipsed elder social statesmen like Twitter (335 million monthly users), LinkedIn (260 million monthly users), and Pinterest (250 million monthly users). Given these advantages, the hunger for information and marketing on Instagram should be no surprise. Several of CMI’s most-read articles published in 2018 covered the platform, and it’s consistently among the top searches on this site. I rounded up the best insights and advice we offer on the topic, making it easier for the Insta-uninitiated to find their footing, while giving expert tips and tricks for power users to level up their initiatives. Instagram puts a visual spin on the micro conversations that turned “tweet” into a marketing verb in 2006. With its unique photography filters, streaming video storytelling features, meme-friendly editing tools, and ease of use on mobile, it’s the perfect platform for capturing those authentic little moments that bring out the human side of your business. Even though your linking options are limited, you can drive a flood of leads by including a relevant and enticing call to action on your bio page. 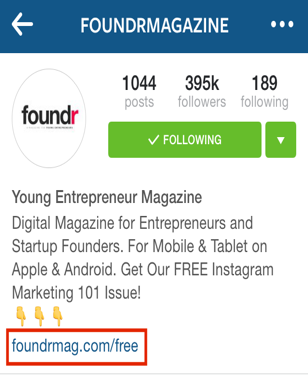 For more tips on using Instagram to drive leads, check out Catalin Zorzini’s four-step strategy guide. While anyone on your content team can set up a personal profile for your business on Instagram, it is easier to manage content activities with a verified business account. Once activated, these accounts can be managed by multiple authorized users and provide deeper insights on followers, performance analytics for posts, advertising tools, and additional post promotion options within the Instagram app. One critical feature that business accounts don’t have is the native ability to schedule posts. Thankfully, third-party tools can let you keep your fans’ feeds full of conversations and activity day and night – even if one social media manager does all the posting. Of course, no matter who (or what) publishes your content, there are guidelines to follow. 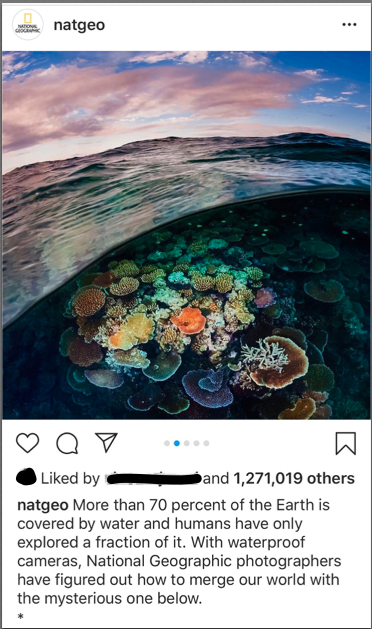 For example, due to the limitations with Instagram’s API, scheduling tools can only publish images and videos formatted in an acceptable aspect ratio. Check out Olga Rabo’s guide to the best Instagram scheduling tools, which includes a handy chart (below) on acceptable image specs. Looks (and lewks) count on Insta. Show off your most appealing brand imagery and supply descriptions that draw viewers more deeply into your brand experience. I mean, c’mon, who could possibly look at this post from NatGeo and not want to dive right into an undersea adventure? 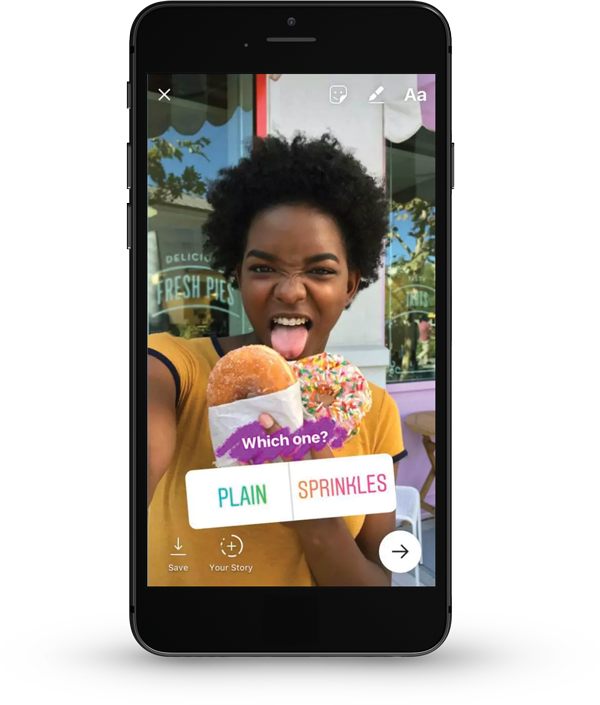 And in this Instagram Stories campaign, Cheerios eschewed imagery, choosing to share a series of personalized, text-based posts set against a simple, brand-appropriate colored background. 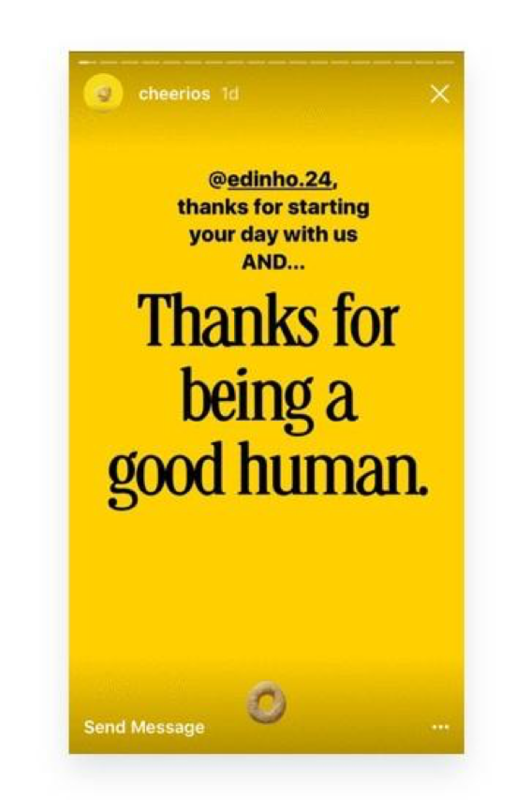 The campaign is designed to trigger positive emotions that the brand’s fans can associate with its “good goes around” tagline. Text-based messages also offer a chance for the more design-minded members of your content team to flex their font-related creativity. Olga Rabo shares nine expert-level font hacks – including a way to animate fonts – that can help bring more visibility to your Stories. Fuel their creativity. Encourage your viewers to create user-generated posts featuring your product or message. Create a contest. Product giveaways are a natural fit for this platform. Don’t forget to use a hashtag that encapsulates your message or captures the viewers’ attention enough to make them want to participate and promote your offering. Demonstrate how your products fit their lifestyle. Consumers like to get ideas and see what other products fit with yours, so keep your content as actionable as possible. Create a live countdown for an upcoming brand event. Add a poll or an emoji slider to gauge fan response to a relevant issue. Enable viewers to select a song to play in the background of your post. Give people a chance to ask something they’re dying to know about your business. For detailed instructions and great examples of how to apply these features to your posts, check out Meenakshi Krishnan’s helpful guide on working with Instagram stickers. Even if only a small percentage of Instagram’s billion monthly users regularly posts updates and stories, your brand’s efforts still need to cut through a lot of content clutter. 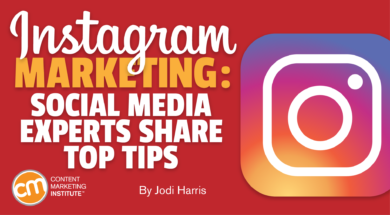 Promoting your posts on Instagram is as important as it is anywhere else in your marketing mix. Branded hashtags feature your company name, making it easier for people aware of your company to discover your content and learn more about you. Community hashtags are more organic to the conversations happening. They help users follow broader topics, specific areas of interest, or other unifying themes. Paid promotions are another way to increase your brand’s reach and engagement on the platform. You can purchase promoted posts and display ads within Instagram’s regular content feed. 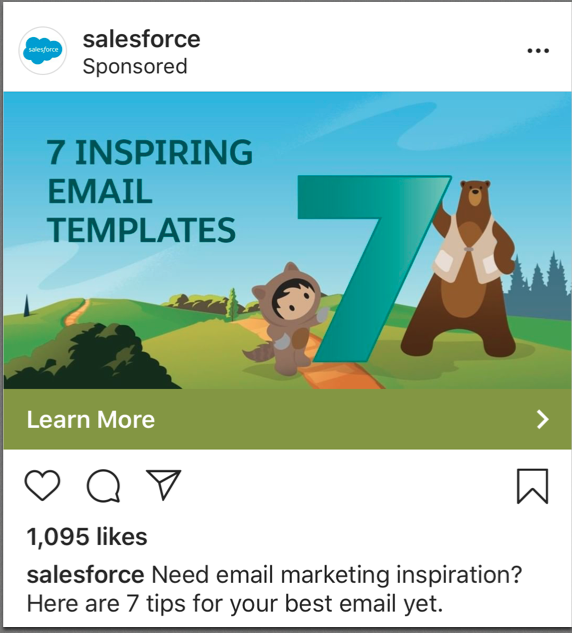 In addition, you can promote your content by placing ads within Instagram Stories, which display your campaigns between image- and video-centric Stories that users click to view. For more details on using paid promotions on Instagram (and other social channels), check out my quick-start guide. Where would content marketing on Instagram be without recommendations from its legions of influencers – i.e., leading voices who have the trust and attention of your target audience? Of course, the extreme popularity of this technique – and the growing concern over influencer fraud – means you may want to consider doing more than paying for a few sponsored posts on an influencer’s feed. For example, you could do a Stories takeover – an influencer of choice takes over your brand account and produces exclusive content for a designated time (typically a few hours or a day at most). Why does a takeover work better than a standard influencer collaboration? As Olga Rabo explains, the incentive for the influencer’s followers is different. They’re not urged to follow the brand but are encouraged by the influencer to see what he or she is doing on your brand’s account. The subtle promotion is more effective to increase reach and drive traffic from Instagram Stories to your site or special offer. For a few more ninja-level tricks for growing your Instagram fan base, check out Olga’s Instagram Stories ideas. One final thought: While sharing is caring when it comes to re’gramming admired content and images, posting someone else’s creative property without securing permission is never cool – and in some cases it could put your business in legal jeopardy. If you want to mitigate your brand’s risk, you need an understanding of copyrights and the terms for fair use. Read more about social media legal ins-and-outs in this article by Allen Murabayashi, which includes tips to help keep your content on the right side of the law. Ready for your moment of Insta-stardom? Whether you share sumptuous photos, livestream your most memorable moments, or inspire viewers with fun hands-on activities, Instagram is a great platform for putting your brand’s best content assets on display. How are you using the channel to connect with your audience? Paint your picture of Instagram success in the comments. Be the first to learn about the latest guides to help your content marketing. Sign up for the free weekday newsletter.